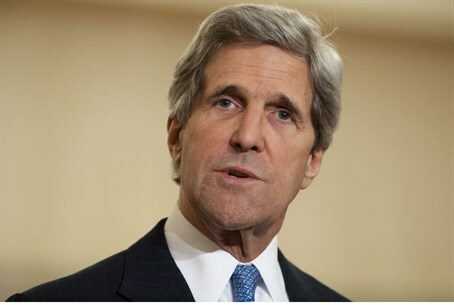 US Secretary of State John Kerry sounded a threatening tone in an interview with Channel 2 television that was aired Thursday, and warned of “chaos” and a “third intifada” if Israel's “peace talks” with the Palestinian Authority (PA) fail. “Intifada,” an Arabic term meaning “shaking off the yoke,” has been used to describe a violent uprising in 1987-1993 and a murderous terror war in 2000-2009 that killed 1,178 Israelis, 70% of them civilians, in over 20,000 attacks that included 144 suicide bombings. The “West Bank” is the term that was used to refer to the Biblical heartland of Judea and Samaria when it was under Jordanian occupation, in 1949-1967. Kerry also said Thursday he has made "significant progress" in the course of the last 24 hours in some areas of Israeli-Palestinian talks, after reaffirming US opposition to Israeli settlements. "We made significant progress in our discussions about a couple of areas of concern in the panorama of the concerns we have," Kerry told reporters in Amman after meeting with Jordanian Foreign Minister Nasser Judeh. “It is important for us to be able to proceed carefully and quietly," he said.